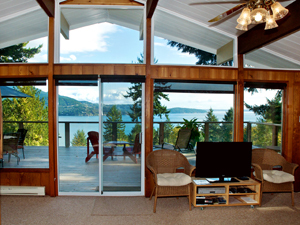 An Inviting Waterfront Cottage / duplex with Spectacular Views located on the east side of Bowen Island, British Columbia. Our cozy cottage provides 2 separate and self contained vacation rentals, the Lazy Bowen Hideaway and the Lazy B Waterfront Suite. Each sleep 4 guests. When groups of 5 - 8 guests inquire we calculate the rental of the Whole House for larger groups. 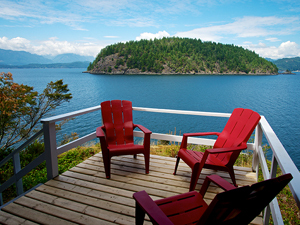 While renting either the Lazy Bowen Hideaway or the Lazy B Waterfront Suite you will have completely separate entrances, parking, decks, and all private amenities. The most common question asked is "Will we have privacy?" Yes, complete privacy while inside your rental. Once outside on the sunny south facing seaside decks or on the Hideaway grounds you will have semi-privacy....Both properties have separate decks, your privacy is similar to that of an apartment balcony… you know there are neighbours but you can’t see them. Take a 30-minute drive north from Vancouver, B.C. to Horseshoe Bay where you will catch the short 20-minute ferry to peaceful and rural Bowen Island. From the ferry landing, the drive is only 8 minutes, 3 K or 2 miles to Cleator Road. Once you arrive at Cleator Road you have choices: 1) Park at the top by the mailboxes and walk down to #1475 for a terrific exercise opportunity. 2) Shift into 4-wheel drive and navigate the road to park on the property. Driving down Cleator Road requires an AWD or 4WD vehicle. An all-wheel or 4-wheel drive vehicle the size of a Ford Explorer or smaller is required to drive Cleator Road. Or, you may choose to park your 2 wheel drive vehicle at the top of the road and take the 5 minute walk down to the cottage. Do you have a physical limitation? For our 2 wheel drive guests we have an optional Cleator Road Shuttle service for your convenience. Our Shuttle Driver will meet you at the top of Cleator Road and then drive your luggage down Cleator Road at Check-in and up Cleator Road at check-out. *This service is dependent on our driver’s availability and may not be available for all requests. 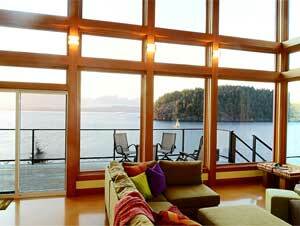 As you enter the Lazy Bowen, you will see a spectacular view of Howe Sound with the city of Vancouver in the distance. Look through the Arbutus trees to make out the peak of Cypress Ski Resort, (only a 30-minute drive from Horseshoe Bay). If you like skiing you may also like to know that Whistler is only 90 minutes away and the site of the 2010 Winter Olympics. This private and remote hideaway is well worth the effort for your total getaway experience.